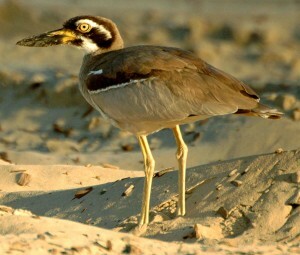 The Beach Stone-Curlew is also known as Beach Thick-Knee. It is the heaviest shorebird in the world. It is about 55cm (22in) in length and weigh about 1kg (2.2lbs). It can be found in the islands of South East Asia, India, the Coastal Eastern Australia as far south as far eastern Victoria, the northern Australian Coast and nearby islands, New Guinea, New Caledonia, Indonesia, Malaysia and the Philippines. It is a very large wader. The adults have a large head, a large bill that tilts up, a hunched posture, stout legs and thick “knees”. These thick “knees” are, in fact, their ankles. Their upper body is mostly grey-brown in colour. The face, shoulder and secondary wings have a black and white pattern on it. Their throat and breast are a paler grey-brown. Their belly is white and their wings are white with some black on the tips. Their large bill is yellow at the base and black at the tip. They have a pair of big yellow eyes and a broad eye patch with white bands above and below the eyes. It loves to be on undisturbed open beaches, exposed reefs, mangrove swamps and tidal sand or mudflats. It feeds day and night. It will move slowly but might sometimes run for short distances. It hunts for crabs and other marine creatures on mudflats and sandpits. It produces a wailing sound which sounds like ‘wee loo’. Their nests will be located on sandpits or islands in estuaries, among the mangrove swamps or in the sand in the grassland. The female will only lay one egg per season. However, if she finds that she has lost her first egg, she may lay a second egg. Isn’t that interesting? Once the egg has hatched both parents will take care of the chick until it is between 7 to 12 months old. It is listed as critically endangered in New South Wales. Their population is affected by their habitat loss as people build houses and factories near where it lives.